As I promised, here is the finished Diaper Wreath for the front door at the baby shower. I got this idea from Martha Stewart (of course). It came out great. 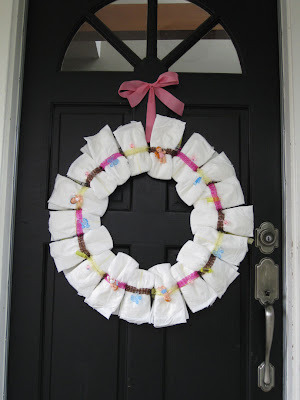 I used 2 sizes of diapers to make the shape more interesting and tied them to a wire wreath frame. You can pick these up at most craft stores near the wreath supplies. I used 3 colors of ribbon and added various plastic baby trinkets to finish them off (bottles, babies, rattles, etc.). Tie it up with a bow and there you go! My best friend is having her first baby soon so I jumped on the chance to throw her a shower. Being almost 6 months pregnant myself, I'm full of creative energy and have baby on the brain. I designed this "logo" of interlocking hearts based off of their wedding invite then added the baby icon in the middle. 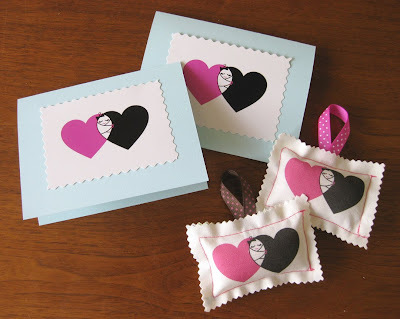 Originally I had wanted to print the design on fabric and sew the swatches to the front of the cards. There is a website called Spoonflower that allows you to upload your own designs for custom-printed fabric. Unfortunately the production was delayed and I ended up printing the designs on regular photo paper. When the fabric finally did arrive, I decided to use the swatches to make little lavender sachets as favors for the guests. I really like how they turned out. Stay tuned for pics of the "diaper wreath" I'm making for her front door!